Thank you for the opportunity to discuss our fiscal year (FY) 2011 budget request. For seventy-five years, Americans have depended on Social Security as an economic safety net to avoid indigence in their old age and when they are disabled. For a number of years, however, we have been struggling to maintain the level of service that the American people deserve because the baby-boomer tsunami began to hit us and, until recently, we had not received full funding of the President’s Budget requests. More recently, the recession has driven numerous economically distressed persons and families to us looking for help. As a result, the President’s Budget request included an eight percent increase in our administrative budget so that we can deal with these challenges. We have been improving our services, but we need sustained and timely funding to ensure that we can continue to deliver the important services that millions of Americans depend upon. I appreciate your ongoing support of our resource needs. I am happy to report that with these resources, we are delivering on our promises to you and the American people. We administer the Nation’s social security programs, including Old-Age and Survivors Insurance and Disability Insurance (OASDI), commonly referred to as Social Security, and Supplemental Security Income (SSI). Through these programs, we touch nearly all Americans at some point in their lives, typically, when they are most in need. The Nation’s recent economic recession, the worst since the Great Depression, has driven over a million more persons to us for assistance. In addition to handling record levels of our core workloads, we issued the $250 economic recovery payments to almost 53 million beneficiaries. These economic recovery payments injected more than $13 billion into the economy. Once again, our dedicated employees stepped up to this challenge and continued to set a high standard for public service. Each year, we find ways to work smarter through innovation, automation, business process changes, and the strong commitment of our employees. We improved our productivity by an average of over 4 percent in the last three years. This combination of resources, improved efficiencies, and hard work has allowed us to make substantial progress, which would have been even better if not for the additional workloads. Since I last addressed this Committee in 2008, we turned the corner on the hearings backlog despite the unexpected surge in our workloads resulting from the economic downturn. After ending a decade of growth in the hearings backlog, we have reduced the pending cases by almost 10 percent in just over a year. As of March, there were fewer than 700,000 cases pending for the first time since FY 2005. We have cut the time it takes to decide those cases by more than three months, from a monthly high of 532 days in August 2008 to 437 days in March 2010. These accomplishments are even more impressive considering that, at the same time, we continued to focus on the oldest, most complex, and time-consuming cases, and we received 30,000 more hearing requests in FY 2009 than we did in FY 2008. In FY 2009, we handled more new benefit applications and appeals than ever before. We adjudicated over 200,000 more initial disability claims, over 500,000 more retirement claims, and 86,000 more hearings than we did in FY 2008. DDS productivity and quality improvements allowed us to decide over 175,000 more initial disability claims than we had expected to complete and keep the pending level below 800,000. Using our fast-track disability processes, Quick Disability Determinations and Compassionate Allowances, we decided cases for about 100,000 applicants with the most debilitating impairments within about ten days after the State disability determination services (DDSs) received their applications. We hope to increase that number to 140,000 this year and 250,000 next year if accuracy can be maintained. In December 2008, we launched a new, improved online application, iClaim, and saw an instant rise in the number of retirement applications filed online. In FY 2009, over 30 percent of all retirement applications were filed online, nearly twice as many as in the prior year. Our internet service has helped us keep up with an enormous growth in retirement claims. Without it, our field offices would be in dire need of even more resources. In addition to providing better and more convenient online options, we reduced waiting times on our 800-number and in our field offices. Last year’s appropriation and Recovery Act funding allowed us to undertake a large hiring effort and to maximize overtime nationwide. In FY 2009, we hired approximately 8,600 employees, most of them in less than six months, which was our largest hiring effort since the creation of the SSI program over thirty-five years ago. Management at every level of the agency responded to this hiring opportunity with the urgency that tough times require. Given the cumbersome federal hiring process and the obstacles erected by some governors and state legislatures in staffing the DDSs, this was a great accomplishment. With our FY 2010 appropriation, we are increasing staff levels in hearing offices and in the DDSs. After reassessing our resources and critical needs, we recently decided to add another 900 hires to the front-lines. Nearly all of these new employees will be placed in our most stressed field offices. The President’s FY 2011 budget request of $12.5 billion is essential to our continued progress. As the American people are still struggling through the economic crisis, we cannot afford to allow our services to deteriorate. A reduction in our funding at this time would reverse the progress we have made over the last two years. While we hope that the worst of the recession is behind us, unemployment is expected to remain high through FY 2011. Since high unemployment rates usually result in more benefit applications, we expect that throughout this year and the next that new claims, particularly for disability, will continue to increase beyond our actuaries’ estimates in the FY 2010 President’s budget. Even if new claims for retirement benefits stabilize, we will still face higher levels of the more labor-intensive disability work in FY 2011. These additional disability claims will ultimately result in more hearing requests. In FY 2011, we will pay $776.5 billion in Federal benefits to 60 million beneficiaries. Social Security trust fund benefit payments are permanently appropriated, and therefore not part of our budget requests before this committee. On the other hand, our appropriations requests include, among other things, the administrative resources that we need to pay benefits. We have four FY 2011 appropriations requests before this Committee, totaling $66.4 billion: Limitation on Administrative Expenses (LAE), Office of the Inspector General, Supplemental Security Income, and Payments to the Social Security Trust Funds. The President’s budget includes $12.379 billion for our LAE, an increase of $932 million in discretionary budget authority from the FY 2010 appropriation. Our administrative expenses are approximately 1.6 percent of our total estimated outlays of approximately $792 billion, which include benefit payments. • Conduct 360,000 medical continuing disability reviews (CDRs) and nearly 2.422 million non-disability SSI redeterminations. In FY 2011, we will need an administrative budget increase of about $770 million just to maintain workyears initially funded by the Recovery Act and to cover inflationary costs, including rent, guards, postage, and employee payroll and benefits. The Recovery Act has given us the resources, including additional staff, needed to reduce the disability backlogs. Since this funding is temporary, however, we need the additional funding in the President’s budget request to retain those resources. In addition to the $770 million, we will need another $162 million to keep up with our growing workloads, reduce existing backlogs, and meet rising customer service expectations. • Ensure Effective Stewardship of Social Security Programs by Increasing Program Integrity Efforts. In addition to accomplishing these goals and handling our core workloads, we have been given additional responsibilities related to Medicare, immigration, homeland security, and data exchanges, such as subsidy determinations for Medicare Part D, e-verify, and the Help America Vote Act (HAVA) workloads. The President’s budget will allow us to continue driving down the hearings backlog, something we were able to do in FY 2009 for the first time in over a decade. Through the first six months of FY 2010, we have reduced the pending level of hearings, for a total of fifteen straight months of progress on our top priority. By the end of FY 2010, we will experience the full effect of the recession on our hearings receipts as the increased initial disability claims work their way through the administrative process. 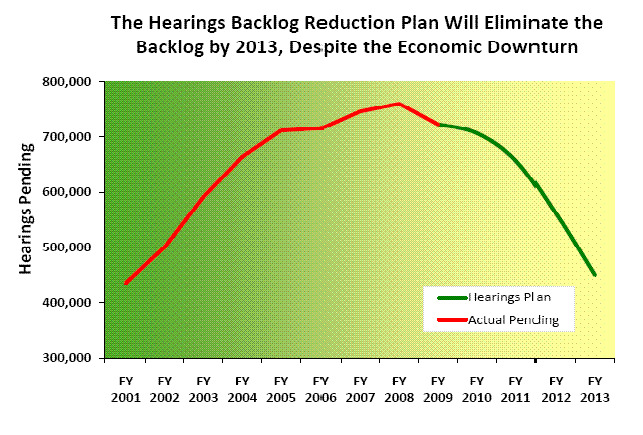 Despite a much higher volume of hearings receipts than we anticipated a year ago, we are still on track to eliminate the hearings backlog by 2013. In order to accomplish that goal, we hired 147 administrative law judges (ALJ) and over 1,000 support staff in FY 2009 and plan to hire 226 ALJs this year. We now have four National Hearing Centers to hear cases by video conference for the most hard-hit areas of the country. As a result of these efforts as well as improvements to the hearings process, we have decreased the number of hearings pending by almost 10 percent over the last 15 months and cut the time it takes to make a decision by over three months. The greatest improvements are occurring in the most backlogged offices. For example, processing time in the Atlanta North hearing office has dropped nearly 45 percent since February 2007, and it will drop again when the Covington office opens in the fall. In FY 2011, with full funding of the President’s Budget, we will be able to hire 70 ALJs and the support staff necessary to maintain at least a 4.5 to 1 support staff to ALJ ratio nationally. With these hires, we will increase our ALJ corps to 1,450. To accommodate this additional staff, we plan to open 25 new hearing offices and our fifth National Hearing Center over the next eighteen months. We opened the first of these offices in Anchorage, Alaska on February 19. With these changes, we expect to reduce processing times by nearly a month and to hold an all-time high of nearly 800,000 hearings, which will reduce the backlog by another 50,000 cases. We know that the rising level of pending initial disability claims is unacceptable, and we are committed to returning to our pre-recession pending level. In FY 2011, we plan to decide over 3.3 million initial disability claims, over 200,000 more than we expect to complete in FY 2010, and to reduce the pending level by 42,000 claims. Our strategy to reduce the initial disability claims pending level includes hiring and providing overtime to the DDSs, increasing Federal disability units that assist the DDSs, and simplifying policy. We escalated our hiring efforts. By the end of FY 2010, we expect to have 2,800 more DDS employees on board than we did at the end of FY 2008, and we will hire additional DDS staff in FY 2011. However, state furloughs of DDS employees have already begun to derail some of our progress in reducing the backlog. We need the full complement of DDS employees to successfully carry out this strategy, and state furloughs of these employees only undermine our efforts. We fund 100 percent of DDS employees’ salaries as well as overhead costs – about $2 billion nationwide this year. These funds cannot be used by the states for any other purpose, so states do not save a single penny by furloughing employees in the DDSs – they only slow paying benefits to the disabled, unduly harm their state employees, and cost the state needed tax revenue. In order to help states with mounting disability claims, we have created Extended Service Teams (ESTs) modeled on the National Hearing Centers. The ESTs are located in states that have a history of good quality and high productivity, as well as the capacity to hire and train significant numbers of additional employees. These centralized DDS teams will help reduce the initial claims backlog as we electronically shift claims to them from the hardest hit DDSs. In March, we opened our first EST in Little Rock, Arkansas. Last week, we opened our second EST in Madison, Mississippi. We plan to open additional ESTs in Roanoke, Virginia and Oklahoma City, Oklahoma by the end of the fiscal year. We are increasing the number of cases that we put through our fast-track processes to speed benefits to tens of thousands of applicants who are obviously disabled. In February, we added 38 more conditions to our list of Compassionate Allowances. The list allows us to quickly identify diseases and other medical conditions that are clearly disabling. It is the first expansion since the original list of 50 conditions was announced in October 2008. We will continue to hold public hearings on other diseases and conditions that might be added to our list of Compassionate Allowances. These public hearings are providing valuable information, not only on potential Compassionate Allowances, but also on our current disability process. For example, as of March, our disability notices now provide website links to helpful health care information. These links will take disability applicants to two U.S. Department of Health and Human Services websites for more information on their conditions, and on where they may find help to pay for prescription drugs. We continue to refine our Quick Disability Determination predictive computer model, which screens initial applications to identify cases where a favorable disability determination is highly likely. This year we expect the DDSs to approve claims in two weeks or less for about 140,000 applicants with the most severe disabilities. In March 2010, we proposed a regulation to expand the single decision maker (SDM) authority to cases that are identified as Quick Disability Determinations or Compassionate Allowances. The single decision maker approach will allow disability examiners to adjudicate certain cases without a mandatory concurrence by a doctor. We also are continuing our successful Wounded Warriors program, which expedites the disability claims of wounded service members who became disabled while on active military service. To assist and reach out to Wounded Warriors, we maintain an on-site presence at several major military treatment facilities throughout the Nation and work closely with advocacy groups and governmental agencies such as the Department of Veterans Affairs and the Department of Defense. We believe this service is a way to show military personnel the thanks they deserve for serving our country. We are developing a new Occupational Information System to replace the Dictionary of Occupational Titles. The Dictionary of Occupational Titles is outdated because it does not reflect current job requirements. In FY 2009, we convened a panel of experts to guide us in the development of the Occupational Information System. In FY 2011, we will begin to design the Occupational Information System, laying the groundwork for pilot testing scheduled to begin in FY 2012. The Listing of Impairments describes for each major body system the impairments considered severe enough to prevent an adult from working, or for children, impairments that cause marked and severe functional limitations. We are regularly updating the listings and have a schedule to ensure we update all of them at least every five years, which will improve our ability to decide whether a claimant meets our criteria for disability benefits. Further, as we update entire body systems we are implementing a process that will allow us to make targeted changes to specific rules as necessary, instead of the entire body system. In the last five years, we have revised approximately half of our listings. In addition to policy improvements, we also are making our process more efficient. We will finish developing the requirements for the DDS Disability Case Processing System, which will serve as a new common system for processing claims in all 54 DDSs. In FY 2011, we expect to begin beta testing this new system. We are rolling out the electronic claims analysis tool (eCat) nationwide. eCAT improves the quality and consistency of our decisions by aiding examiners in documenting, analyzing, and completing the disability claim in accordance with regulations. We expect that the use of eCAT will produce well-reasoned determinations with easy-to-understand explanations of how we reached our decision. This documentation is particularly useful for future case review if an appeal is filed. In addition to enhancing the documentation and consistency of our disability decisions, eCAT has been an extremely useful training tool for the many new examiners we are hiring in the DDSs. All states have the training version of eCAT. Training through eCAT is helping new examiners more quickly gain proficiency. Health Information Technology (Health IT) will revolutionize our disability determination process. We need medical records to decide disability claims. We rely upon doctors, hospitals, and others in the healthcare field to provide medical records in a timely fashion. Today, we are taking the first steps towards a totally electronic system of requesting and receiving medical records. With the consent of our claimants, we will have instantaneous access to their medical records. In January 2010, we used over $17 million in Recovery Act funding to expand Health IT to 15 additional providers across 12 States. Our Health IT pilots in Massachusetts and Virginia demonstrated that electronic medical records can reduce disability processing. Some disability decisions are now made in days, instead of weeks or months. We are also improving our online services. We need faster and easier online services to meet the baby boomer’s expectations and to help us keep up with increasing claims. Our new, easy-to-use online application, iClaim, has been a huge success. In FY 2009, we rolled out the first phase of iClaims, and we have seen a significant increase in internet claims as a result. In fact, in FY 2009, online claims represented 83 percent of our total retirement claims growth. Without this online filing, our field offices would be seeing an even greater number of visits and increased wait times. We continue to expand our online offerings. Beginning in March, the public can now file for Medicare benefits online. In addition, our Multilanguage Gateway provides access to information in fifteen different languages, and we are on track to implement our first non-English interactive application, the Retirement Estimator, in Spanish later this year. Our FY 2011 budget depends on continued growth of online filing of retirement and disability applications. We expect to reach 50 percent of retirement applications filed online by FY 2012. We also are modernizing one of our key data collection forms in the disability process, the Adult Disability Report to streamline data collection and make the form more user-friendly. We now have the top three online services (Retirement Estimator, online retirement application, online Medicare Extra Help application) in the private and public sector as rated by the American Customer Satisfaction Index. Telephone service is more convenient for the public than many in-person visits and more efficient for our agency. In 2009, we reduced our 800-number wait times by 25 percent with the help of additional staff. In FY 2011, we will open our first new teleservice center in more than a decade. This center will serve the entire country and will allow us to provide more timely telephone service to the millions of Americans who call our toll-free number. We plan to replace our national 800-number infrastructure, which will provide state-of-the-art tools to improve service delivery and increase efficiencies by giving citizens additional ways to communicate with us such as web chat and web callback. We maintain benefit, earnings, and demographic information on virtually every American. Over the last decade, we have moved from a paper-based system to electronic processing of our core workloads. In light of the new electronic environment, part of our plan to secure our data network is to strengthen our data center operations, both by bringing online the Second Support Center (SSC) and by replacing our aging National Computer Center (NCC). Our SSC is up and running. It handles part of our workloads and will provide backup service in the event of a failure at the NCC. Thanks to the Recovery Act funding, we are proceeding in the construction of our new National Support Center, which is scheduled to be completed in 2013. In addition to the important services we provide to the public, we must also continue to increase our cost-saving program integrity efforts. The Administration is committed to implementing a multi-year plan to enhance government-wide program integrity efforts. Program integrity reviews ensure that Americans’ tax dollars are spent properly and that beneficiaries continue to be eligible for benefits and are being paid the right amount. Program integrity reviews help to avoid improper payments, which have continued to grow in total dollar amounts as our programs have grown. The FY 2011 budget includes resources for two types of program integrity efforts: continuing disability reviews (CDRs), which are periodic reevaluations to determine if beneficiaries are still disabled, and SSI redeterminations, which are periodic reviews of non-medical factors of eligibility, such as income and resources. In FY 2011, we plan to conduct 360,000 full medical CDRs and 2,422,000 redeterminations. Both CDRs and redeterminations are extremely cost-effective. Our FY 2011 budgeted levels continue our efforts to increase program integrity levels from their low point a few years ago. Program integrity activities save the Government money. We estimate that every dollar spent on CDRs yields at least $10 in lifetime program savings. Similarly, we estimate that every dollar spent on SSI redeterminations yields $8 in program savings over 10 years, including savings accruing to Medicaid. In addition, in FY 2011, we will continue nationwide rollout of our Access to Financial Institutions (AFI) project, which automates verification of SSI applicants and recipients’ assets held in banks. In conclusion, FY 2011 is going to be a year full of challenges for us. Our workloads will continue to grow beyond our earlier expectations while we work to fulfill our commitments to reduce the hearings and initial disability claims backlogs and to lay the foundation for the future of the agency. We are making a real difference in the service we deliver to the American people. Without the additional funding Congress provided to us since FY 2008, Americans would now be facing significantly longer waits to receive decisions on their claim, to speak to a representative in our field offices or on the phone, and to have their case heard by an ALJ. Sustained, timely, and adequate funding, along with innovation, automation, improved business processes, and the hard work and dedication of our employees has made this progress possible. The FY 2011 President’s budget represents the next step in service improvement throughout the agency. The President’s budget will allow us to fulfill our commitments to keep up with all retirement claims, work towards our goal of eliminating the hearings backlog, reduce the initial disability claims backlog, address other critical workloads, and maintain our aging infrastructure. A reduction in our funding at this time would reverse the progress we have made over the last two years. Millions of Americans count on us, and we need your continued support to provide the service they need and deserve. I would like to turn now to a brief summary of the other appropriation requests for FY 2011. $106.122 million for the OIG – The request for FY 2011 represents a $3.44 million increase in resources from the FY 2010 appropriation. The OIG’s mission is to promote economy, efficiency, and effectiveness in the administration of the Social Security programs and operations and to prevent and detect fraud, waste, abuse, and mismanagement in such programs and operations. To that end, the OIG provides an invaluable service by conducting a comprehensive program of audits, evaluations, and investigations, and recommending changes to improve our programs and operations. To meet its homeland security responsibilities, OIG will continue to conduct audits and investigations that focus on strengthening the enumeration process and combating SSN misuse. The OIG will also audit and evaluate our use of funds for carrying out Recovery Act initiatives. $56.5 billion for the SSI Program – The SSI program ensures a minimum monthly level of income to eligible aged, blind, and disabled individuals. An individual’s income, resources, and living arrangements are evaluated to determine the monthly SSI payment. The President’s budget reflects $52.6 billion for Federal benefit payments to approximately 7.8 million aged, blind, and disabled beneficiaries: $3.775 billion for SSI administrative expenses; $60 million for beneficiary services; and $43 million to fund extramural research and demonstration projects for FY 2011. The budget also includes $13.4 billion for Federal benefit payments for the first quarter of FY 2012. Estimates of current benefits are driven by the number of recipients eligible for monthly payments and the amount of the monthly payments. The FY 2011 request represents a $6 billion increase over the FY 2010 enacted level. The majority of this increase results from mandatory increases in Federal benefit payments. Along with an increase in SSI recipients, FY 2011 also includes 13 monthly benefit payments, instead of the usual 12. This is because October 1, 2011 falls on a weekend, and so the October check will be paid on September 30, 2011. $21.4 million for Payments to the Social Security Trust Funds – This request will reimburse the Social Security trust funds for the costs of certain benefits and administrative expenses which are initially paid from the trust funds but are chargeable to general revenues. The purpose of this account is to put the trust funds in the same financial position in which they would have been had they not borne the cost of these expenses. The fiscal year (FY) 2011 appropriation request for Payments to Social Security Trust Funds totals $21,404,000 and covers general fund payments to the Social Security trust funds. Included in this request is $6,400,000 to reimburse the Old-Age and Survivors Insurance (OASI) trust fund for the cost of administering pension reform responsibilities assigned to the Social Security Administration under Public Law 93-406, the Pension Reform Act. The reimbursement is for the cost of furnishing information on deferred vested pension rights to pension plan participants or their survivors. The request for FY 2011 is the same as the FY 2010 funding level and reflects the potential level of effort associated with this work, which flows from reports received from the Internal Revenue Service regarding individuals who have earned vested pension rights. In the event that actual expenses needed to process this workload exceed the amount available for reimbursement through this account in any fiscal year, the trust fund is made whole in the subsequent fiscal year upon enactment of the Payments to Social Security Trust Funds appropriation for that year. Also included in this request is $14,000,000 to reimburse the OASI and Disability Insurance (DI) trust funds for the value of interest on benefit checks that remain uncashed after 6 months. This payment is authorized by Section 201(m) of the Social Security Act and Section 152 of the Social Security Amendments of 1983 (P.L. 98-21). The request for FY 2011 is the same as the FY 2010 funding level. It supports the expected level of uncashed check activity and represents the estimated interest for unnegotiated OASDI checks. Social Security checks are negotiable for only 12 months from their date of issue under the provisions of the Competitive Equality Banking Act of 1987 (P.L. 100-86). The face value of these checks is credited directly to the trust funds from the general funds when the checks are canceled. This account reimburses the trust funds for interest lost through the date of crediting at the following points in the check negotiation process: (1) checks that remain uncashed after 6 months; (2) checks that are cashed after 6 months; and (3) checks that are administratively canceled after 12 months. The request before this Committee includes $4,000 to reimburse the OASI trust fund for the cost of special benefits paid to certain uninsured persons aged 72 years and over. The benefits have been paid mainly to individuals who attained age 72 before 1968 and did not have a chance to work long enough under Social Security to become insured. This payment covers benefits paid in FY 2009. The amount requested also includes reimbursement for related administrative expenses and interest lost to the trust fund. The population receiving special payments is a closed group of very aged persons. As of September 30, 2009, one person was receiving benefits under this program, the same as on September 30, 2008. The request before this Committee does not include additional funds to reimburse the OASI trust fund for work carried out under Section 19141 of the Energy Policy Act of 1992 (P.L. 102-486), which established the “Coal Industry Retiree Health Benefit Act of 1992” (CIRHBA). CIRHBA requires the Social Security Administration (SSA) to search earnings records of certain retired coal miners to determine which mine operators are responsible for payment of their health benefit premiums under the law. SSA computes the premiums due based on a formula established in the Act, notifies the affected mine operators, processes appeals from operators who believe that assignments have been made incorrectly, and responds to and participates in litigation resulting from these agency determinations. Additional funds are not requested for FY 2011 because amounts remaining from the $10,000,000 per year appropriated in FY 1996 and in FY 1997 will continue to be available until expended to reimburse the OASI trust fund. SSA has devoted considerable time and resources to comply with P.L. 109-432. All court cases challenging SSA’s involvement in the Coal Act are now closed. There is no active litigation. In the past, SSA was obligated to provide yearly data on miner assignments to the United Mine Workers of America (UMWA) Combined Benefit Fund. However, this year SSA provided the UMWA Combined Benefit Fund with data that should constitute the SSA’s final records on miner assignments and the companies involved in this workload. Currently, the only remaining SSA obligation is to provide yearly per beneficiary premium calculations from the Chief Actuary to the UMWA Combined Benefit Fund. The FY 2011 request includes $1,000,000 to reimburse the DI trust fund for the costs of granting noncontributory wage credits for pre-1957 military service, as authorized by Section 217(g) of the Social Security Act. The 1946 Social Security Amendments provided for payment of Social Security benefits to World War II veterans and their survivors based on noncontributory wage credits for each month of the veteran’s active military service. To finance the additional costs of paying benefits based on periods of military service before 1957 for which no contributions were made, the Social Security Act provides for reimbursement to the OASI and DI trust funds from the general funds of the Treasury. The Social Security Amendments of 1983 modified procedures for reimbursing the trust funds, with an initial lump-sum transfer based on the estimated present value of all future benefits arising from noncontributory credits granted before 1957, subject to adjustment every fifth year beginning in 1985. Following the transfers to the trust funds in 1983 and 1985, subsequent quinquennial adjustments have called for transfers from SSA’s trust funds to the general funds of the Treasury, with the exception of 2000, when an appropriation was needed in FY 2002 to transfer general funds to the OASI trust fund. The actuaries determined that $1,000,000 should be transferred from the general funds to the DI trust fund in FY 2011, including interest, as authorized under Section 217(g). SSA’s appropriation request will enable SSA to implement the quinquennial DI adjustment. The Supplemental Security Income program (SSI) guarantees a minimum level of income to financially needy individuals who are aged, blind or disabled. The appropriation request for fiscal year (FY) 2011 is $40,513,000,000, in addition to the $16,000,000,000 appropriated for the first quarter of FY 2011 in the FY 2010 appropriation, bringing the total to $56,513,000,000. This includes $52,635,000,000 for Federal benefits to aged, blind and disabled recipients, $3,775,000,000 for administrative expenses, $60,000,000 for beneficiary services, and $43,000,000 for research and demonstration projects. In addition to the appropriation request, in FY 2011 SSA is also planning to use $26,000,000 in carryover for beneficiary services, and $28,900,000 in carryover for research and demonstration projects. We are also requesting an advance appropriation of $13,400,000,000 for the first quarter of FY 2012 to ensure that benefits will continue without interruption into the next fiscal year. The SSI appropriation provides funds for direct cash assistance to eligible aged and blind or disabled recipients to help finance their basic needs. We evaluate an individual’s income, resources and living arrangements to compute the monthly SSI payment. The maximum monthly Federal Benefit Rate (FBR) is $674 for an individual and $1,011 for a couple in calendar years (CY) 2010 and CY 2011. We expect the average monthly benefit to increase from $503 in FY 2009 to $514 in FY 2010, and remain at that level in FY 2011. The total FY 2011 request for Federal benefit payments is $52.6 billion. This is an increase of $6.03 billion from the amount appropriated for Federal benefits in FY 2010, mainly because there are 13 payments in FY 2011. The maximum monthly FBR usually increases each January based on increases in the cost-of-living. Due to the economic downturn, there was no increase in January 2010 and we project no increase for January 2011. We expect the average number of Federal SSI recipients to increase from 7,560,000 in FY 2010 to 7,820,000 in FY 2011, an increase of about 3.4 percent. SSA expects to use $262 million in carryover of prior-year unobligated balances in FY 2010 and does not anticipate any carryover in FY 2011. SSA administers the SSI and Social Security programs on an integrated basis for purposes of economy and efficiency. The Social Security Act authorizes SSA to pay for SSI administrative expenses from the Social Security trust funds through the Limitation on Administrative Expenses (LAE) account. This appropriation funds the SSI program’s share of administrative expenses incurred through the LAE account. In the event that actual SSI administrative expenses exceed the amount available for reimbursement through this account in any fiscal year, the trust funds are made whole in the subsequent fiscal year upon enactment of the SSI appropriation for that year. The FY 2011 request for SSI administrative expenses is $3,775,000,000. This includes $292 million in cap adjustment funding specifically for program integrity activities—conducting continuing disability reviews and SSI redeterminations, and completing implementation of the Asset to Financial Institutions project. In addition to these amounts, funds from state supplementation user fees are made available in the LAE account. State supplementation is mandatory for certain recipients who were on state rolls just prior to the creation of the Federal program in 1974. Otherwise, states are encouraged to supplement the Federal benefit and may elect to have SSA administer their program. States that choose to have SSA administer their program reimburse SSA for the costs based on a user fee schedule established by the Social Security Act. The LAE account assumes funding of $185,000,000 from state supplementation user fees in FY 2011. This activity funds reimbursements to Vocational Rehabilitation (VR) agencies for rehabilitation services provided to SSI recipients. It also funds payments to Employment Networks (ENs) authorized under the “Ticket to Work and Work Incentives Improvement Act of 1999” (P.L. 106-170). SSA plans to obligate $86 million for beneficiary services in FY 2011. The Ticket legislation allows SSI disabled recipients more flexibility in obtaining “return to work” services by providing them with a Ticket to offer an EN of their choice in exchange for VR services, employment services, and other support services. The regulation to implement the Ticket to Work Program was effective January 28, 2002. The Ticket program has been rolled out to all States and U.S. territories since September 2004. A revision of the Ticket to Work regulation, published on May 20, 2008, was effective July 21, 2008. This revised regulation increases up-front costs by increasing the frequency and levels of payments to providers. This revision also allows a Ticket holder to receive VR services to meet his/her intensive up-front service needs. After the VR case is closed, his/her Ticket may be assigned to an EN to receive ongoing support services. The Social Security Act provides funding authority, including waiver authority for the SSI program where appropriate, for research and demonstration projects. Authority is provided for conducting both broad-based cross-program projects in the Social Security and SSI programs, and for projects dealing with specific SSI program issues. The Social Security Act also requires SSA to conduct outreach efforts to identify individuals who may be eligible for payment of the cost of Medicare under the Medicare Savings Program. The passage of the Medicare Prescription Drug, Modernization, and Improvement Act of 2003 (P.L. 108-173), expanded the existing cost-sharing outreach requirements to include outreach to beneficiaries who may potentially be eligible for Medicare prescription drug subsidies under Medicare Part D.
Compassionate Allowances – This initiative is designed to expedite disability determinations for individuals who, often at the time of application, meet SSA’s medical criteria for disability. Compassionate Allowances are a way of quickly identifying diseases and other medical conditions that clearly qualify for Social Security and Supplemental Security Income disability benefits. It allows the agency to electronically target and make speedy decisions for the most obviously disabled individuals. On March 1, 2010, SSA added 38 more conditions to the Compassionate Allowance initiative. This is the first expansion since the original list of 50 conditions was announced in October 2008. We expect to complete approximately 4.5 percent or 150,000 initial claims under the Compassionate Allowance initiative. Occupational Information System Development Project – SSA is developing an occupational information system (OIS) tailored for SSA’s disability programs to replace the Dictionary of Occupational Titles currently used in the agency’s disability determination process. In FY 2009, SSA established the Occupational Information Development Advisory Panel (OIDAP) under the Federal Advisory Committee Act. In September 2009, the OIDAP delivered its first set of recommendations to the agency on the content model and classification system for a new OIS that may best meet SSA’s needs. The OIDAP will continue to provide advice and recommendations throughout the research and development process. The content model refers to the data elements or attributes that we use to describe each occupation in the new OIS. External stakeholders submitted significant comments to the OIDAP regarding data elements for the content model. Also, in FY 2009, SSA conducted an internal user needs analysis to gather input from adjudicators and program staff regarding data elements that SSA might need. In FY 2010, SSA will prepare a content model based on a synthesis of the OIDAP’s recommendations and external and SSA users’ information. SSA will develop an overall design of the OIS based on our program and data criteria. SSA will complete a draft content model and prototype instruments for both person- and job-side data elements, and continue to meet with the Department of Labor to exchange status on each agency’s occupational information development activities. In FY 2011, SSA plans to test the person-side instrument and conduct job analyses of the work-side instrument. This initial job analysis effort will provide SSA with the opportunity to develop and test sampling methods and data collection options. Temporary Assistance for Needy Families (TANF)-SSI Disability Transition Project In 2004, the Government Accountability Office recommended that SSA and the Department of Health and Human Services’ Administration for Children and Families (ACF) collaborate to examine ways to better coordinate the SSI and the TANF programs. To address this recommendation, SSA has partnered with ACF to conduct the TANF-SSI Disability Transition Project. The project will link state and local TANF caseload data to SSA administrative data to understand the dynamics of the population applying for and/or served by the two programs. The project will also examine promising program innovations to coordinate TANF and SSI to better serve individuals with disabilities, and help states and localities refine and pilot-test program innovations, and provide recommendations for a full demonstration project and rigorous evaluation. SSA and ACF jointly fund and manage a research contract to analyze TANF-SSA administrative data, examine local program innovations, and provide recommendations for a demonstration and evaluation. SSA is using FY 2010 funds for data and program analysis, technical assistance for site development and pilot tests, and to identify options for a demonstration and evaluation. SSA will use FY 2011 funds for a separate contract to begin the demonstration and evaluation. Youth Transition Demonstration (YTD) – assists young people with disabilities, aged 14-25, to successfully transition from school to economic self-sufficiency. These youths are those who receive SSI or Social Security Disability payments based on their own disability, or who are at risk of receiving SSI or Social Security Disability benefits. Successful transitions include pursuing a post-secondary education or employment. Through agreements with community-based agencies at six sites in five states, YTD provides a broad array of transition-related services and supports to participants. YTD staff also establishes partnerships and collaborates with other agencies and with employers to improve employment and educational outcomes. The YTD provides five waivers of program rules to allow youths to keep more of their earnings and to encourage saving for youth to continue their education and career objectives. The projects are testing whether these modified SSI rules will encourage YTD participants to work and save for their future. The projects will complete services in 2012. SSA will conduct surveys and analysis through 2013, and final reports are due in 2014. The YTD project has joint funding with section 234, as appropriate, based on the participation of title II and title XVI beneficiaries. In FY2011 the focus will be on employment services for these sites and the follow-up survey administered 12 months after random assignment. These surveys will fill in gaps and provide information on demographic and socioeconomic variables not in the administrative data. This will also provide outcomes such as work efforts, hourly wages, and attitudes towards work. This information will be very important in analyzing outcomes in the areas of education and self-efficacy. Evaluation of the Ticket to Work – In this evaluation, SSA is examining participation by both beneficiaries and the new Employment Networks (EN) created by the program. The study will provide feedback to policymakers through periodic reports detailing data collection, findings and recommendations for program modifications. Recent findings indicate that beneficiaries are taking longer to reach employment goals than was initially anticipated, but that the beneficiaries are making continued progress toward self-sufficiency even four years after assigning their tickets. We are using the National Beneficiary Survey to identify work-oriented beneficiaries, and have found that 40 percent of working-age disability beneficiaries reported having work goals or expectations. We also found that such beneficiaries are about nine times more likely to participate in employment-related activities. Work-oriented beneficiaries are also significantly more likely to have earnings and to have higher earnings relative to other beneficiaries. We also completed a longitudinal analysis of beneficiaries who first received Social Security Disability in 1996. This analysis revealed that by 2006, 6.5 percent had left the rolls due to work, at least temporarily, and 3.7 percent had terminated benefits due to work without returning to the benefit rolls. Additional analyses of the duration of exits due to work have found that among those who left the rolls due to work for at least one month in 2002, those in the outcome only payment system spent 60.4 percent of the next 48 months off the rolls, compared with 53.1 percent and 42.3 percent of months among traditional system and milestone plus outcome participants, respectively. In July of 2008, we implemented changes to the Ticket to Work program to improve EN and beneficiary participation and outcomes. We will examine whether the new regulations improve the Ticket to Work program in our 2010 and 2011 evaluation reports. Specifically, we will report on EN and beneficiary participation response to the new Ticket to Work rules, beneficiary awareness of the new Ticket to Work program, service use, employment, and attitudes toward ticket participation, work, and possible exit from SSA benefits, and the trends in beneficiary work and benefit outcomes and EN payments under the new rules. Programmatic Longitudinal Disability Data Repository (PLDDR) – SSA has a critical need to examine more longitudinal data to identify trends within the disability program to make better-informed policy decisions. To address this need, we are starting a multi-year project in FY 2010 to create a new repository of disability data files and databases in a centralized location. This data repository will modernize the role and functions of the current Disability Research File and eliminate the current time-intensive processes. The new system will utilize state-of-the-art technologies that will modernize and automate the process and will be built with at least 20 rolling years of data, including the current year, on a continuous basis. FY 2011 will continue FY2010 Phase One activities devoted to the analysis of many data sources/files within SSA to select the appropriate data to be used for disability trends and research. Policy Evaluation – As policy issues emerge, SSA must maintain the ability to conduct research to evaluate the expected effects on the Social Security and SSI programs, beneficiaries, and potential beneficiaries. Related goals are to enhance our ability to produce additional policy-relevant data and to improve the quality of statistics on the aged and persons with disabilities. We anticipate that we may be asked to analyze a range of policy issues. For example, in response to the financial crisis of 2008, we expect to conduct studies to evaluate the effects of the financial crisis on labor force participation, retirement, and claiming of Social Security disability and retirement benefits. Medicare Buy-In (Section 1144/1110 Outreach) – Medicare Buy-in Outreach, section 1144 of the Social Security Act, requires SSA to conduct outreach to SSA beneficiaries and former beneficiaries who may potentially be eligible for the Medicare Savings Program. In addition, SSA is required to share lists of those potentially eligible with State Medicaid agencies. Medicare Part D Prescription Drug Outreach (Section 1144/1110 Outreach) – The major objective of these projects is to increase enrollment of eligible low-income individuals into programs that assist Medicare beneficiaries with their out-of-pocket prescription drug expenses. Retirement Research Consortium (RRC) – One of SSA’s key tools for maintaining a strong capability for research on Social Security and retirement is the Retirement Research Consortium (RRC). The RRC is funded under 5-year cooperative agreements. The current agreements support centers based at the University of Michigan, Boston College, and the National Bureau of Economic Research. The RRC provides the agency with access to the best analysts on the full range of Social Security and retirement issues, including analyses on retirement behavior, the well-being of the retiree population, savings trends, the impact of aging societies, Social Security reform, individual accounts and investment behavior, and lessons from abroad. In recent years, SSA has increased the emphasis on disability research and program interactions. The RRC also is charged with disseminating results through publications, web sites, and conferences, training junior scholars and practitioners in the areas of Social Security, retirement, and disability, and facilitating the use of SSA administrative data for policy research purposes. Retirement Income Modeling – provides policy makers with detailed information on the effects of changes in Social Security on individuals and the economy, with projections for years into the future. SSA’s MINT model (Modeling Income in the Near Term) has become one of the most important tools for evaluating the effects of Social Security reform proposals on the distribution of retirement income. SSA analysts use MINT to provide distributional analysis on how baby boom retirees will fare under reform proposals compared to current law. Current funding supports updating MINT to the most current data and developing a basic capability to project disabled worker beneficiaries in future populations of all ages. The research budget also supports models that provide long-term projections and consider the effects of changes in Social Security on the economy as well as some small jointly financed cooperative arrangements with the National Institute on Aging to study factors affecting the wealth and retirement of elderly Americans and the financial crisis of 2008. Data Development – forms the foundation upon which model development efforts and analytical capabilities are built. SSA’s administrative data are useful in addressing many policy issues, but they often provide an incomplete picture of the effects of current and proposed policies. Consequently, SSA must seek cost-effective methods for obtaining the necessary data from other sources. SSA provides support for the Census Bureau’s Survey of Income and Program Participation and the National Institute on Aging’s Health and Retirement Study. These expenditures support improvements to the quality of survey data that are of particular importance for Social Security, more complete linkage of program and survey data, and greater usage of data by researchers. Financial Literacy – SSA research activities include support for the agency’s financial literacy and education initiative that is designed to encourage saving and foster effective retirement planning. These objectives support the SSA Special Initiative to Encourage Saving as well as the goals of the national interagency Financial Literacy and Education Commission. The initiative will achieve these objectives by supporting research and data resources to develop, test, and refine effective print, web-based, and other products that can be used to better inform the public about saving, the Social Security program, and retirement planning. The primary mechanism for conducting these research activities is a consortium that develops and maintains a network of research and development experts supported through a cooperative grant with the SSA – the Financial Literacy Research Consortium (FLRC). The FLRC is comprised of three multi-disciplinary research centers conducting research and development activities to produce products and interventions to improve knowledge about SSA programs and encourage saving. The President’s fiscal year (FY) 2011 request for the Limitation on Administrative Expenses (LAE) account is $12.379 billion, an increase of 8 percent or $932 million over FY 2010. These resources, which include funds generated by user fees, are used to pay the costs of administering the Old-Age and Survivors Insurance (OASI) and Disability Insurance (DI) programs, the Supplemental Security Income (SSI) program, Special Benefits for Certain World War II Veterans, the Medicare prescription drug program, and certain other Medicare support functions. 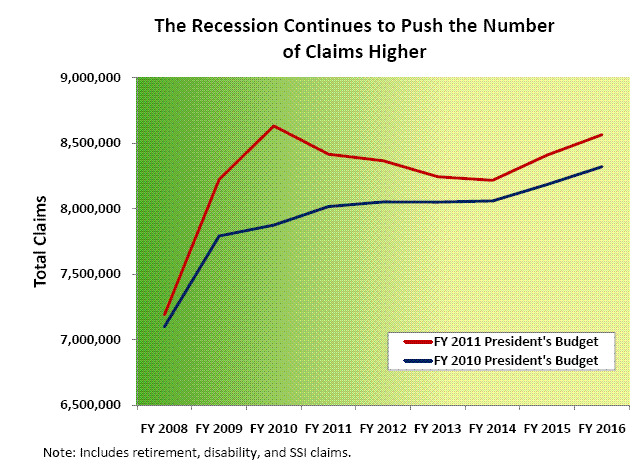 The recession is generating an unprecedented surge in new disability claims and related work for the agency. Funding SSA at the President’s Budget level will enable the agency to complete more of the higher levels of work we have been receiving and to cover inflationary cost increases. In FY 2011, we will complete nearly 8 percent or 236,000 more initial disability claims than in FY 2010, which will enable us to reduce the pending level from 1,041,000 to 999,000. We will complete over 10 percent or 74,000 more hearings in FY 2011 than in FY 2010, which will further reduce the number of hearings pending to 657,000. The FY 2011 budget will also enable us to keep up with the influx of baby boomer retirement claims--we plan to complete all of the retirement claims we receive, estimated to be 4.6 million in FY 2011. In FY 2011, we are facing approximately $420 million in inflationary costs for rent, guards, postage, and pay and benefit increases. Additionally, we will need almost $350 million to maintain the workyears we funded with Recovery Act funds in FY 2010. We will need funding above this level to keep up with our growing workloads, reduce existing backlogs, and meet rising customer service expectations. Without the FY 2011 President’s Budget, we will lose ground on all the important progress we have achieved over the last couple of years. The LAE budget request includes just over $9 billion for Federal salaries and operating expenses, which covers increases in costs due to Federal pay raises and higher benefits costs, as well as increases in the cost of rent and other infrastructure and work processing costs incurred by SSA offices across the nation. SSA utilizes a mix of full-time equivalents and overtime to support the total workyears required to complete planned levels of work. This budget supports 70,409 workyears for SSA proper, essentially providing stable staffing and stopping a trend in recent years of staffing declines that have negatively affected service to the public. With 1,400 offices in cities and towns across America, it is imperative that SSA receive the funds required to pay the salaries and support the infrastructure and workload processing costs necessary to provide service to the millions of Americans who count on us each and every day. The LAE budget request includes $2.631 billion for operating expenses for the State DDSs. This represents an increase of $344 million over FY 2010 to cover higher costs associated with state pay raises, higher costs for medical evidence, an increase in workyears to help address the massive influx of initial disability claims, and the cost of maintaining the workyears we funded with Recovery Act funds in FY 2010. SSA estimates that the DDSs will complete 3.3 million initial disability claims in FY 2011, which is nearly 8 percent more claims completed than in FY 2010 and almost 18 percent more than in FY 2009. Successful efforts such as the electronic disability process and SSA’s new Quick Disability Determination and Compassionate Allowance processes will continue to improve service to the public by ensuring that claimants receive decisions as quickly as possible. The President’s Budget also includes $635 million for Information Technology (IT). The agency will use these funds to continue to support our nationwide IT infrastructure and to continue to make investments in workload processing technologies that help increase productivity and improve quality. SSA will offer additional services on our website, improve the automated services we offer by telephone, and ensure that the sensitive information entrusted to us is protected and can be restored in the case of a disaster. Technology and business process improvements will play an instrumental role in helping SSA continue to make incremental productivity improvements. Our investments in IT have played an important part in helping us increase productivity by 3.17 percent on average over the last 5 years. With adequate funding and careful planning and implementation of new initiatives, the efficiency of our processes will continue to improve. The President has proposed caps on net discretionary budget authority and outlays in FY 2011. The FY 2011 President’s Budget would allow adjustments to these caps for spending above a base level of funding for several Government-wide program integrity activities, including SSA’s CDRs and SSI redeterminations. In FY 2011, the LAE request includes a total of $796 million dedicated for CDRs and SSI non-medical redeterminations. The request specifies that upon enactment of discretionary spending caps, $513 million of SSA’s budget request would not count towards the overall cap on discretionary budget authority. CDRs are the most effective mechanism SSA has for determining whether DI and SSI disability beneficiaries have medically improved or continue to meet the statutory definition of disability. CDRs are a proven, sound investment – yielding $10 in lifetime program savings for every $1 spent. SSI redeterminations are periodic reviews of non-medical factors of SSI eligibility. The additional funding requested for redeterminations is estimated to provide a return on investment of better than $8 in program savings over 10 years for each $1 spent, including savings accruing to Medicaid. SSA plans to complete 360,000 medical CDRs and 2.4 million SSI redeterminations in FY 2011. In addition, up to $10 million may be used to complete implementation of the Access to Financial Institutions project, which automates verification of SSI recipients’ assets held in banks. In total, SSA estimates this program integrity funding in FY 2011 will result in over $7 billion in savings over 10 years, including Medicare and Medicaid savings. The FY 2011 LAE request includes up to $185 million in funding from user fees that are paid by certain states to help cover agency costs for Federal administration of their SSI State supplementation payments. The FY 2011 LAE request also includes up to $500,000 in fees for certification of non-attorney representatives, as provided in section 303(c) of the Social Security Protection Act. On February 27, 2010, President Obama signed into law the “Social Security Disability Applicants’ Access to Professional Representation Act of 2010,” permanently extending the non-attorney representative fee withholding process. The FY 2011 President’s Budget for SSA provides the necessary resources for the agency to continue to make progress toward improved customer service. Full funding of the President’s Budget will enable the agency to maintain recent gains in staffing and to continue to invest in needed technology enhancements. SSA will be able to complete substantially more claims through a disciplined and focused effort to keep up with the onslaught of work from both the recession and the wave of baby boomers seeking our services. Even during difficult times, we have produced measurable and meaningful results. We are making progress in key workloads while anticipating future trends and preparing for upcoming challenges. The President’s FY 2011 budget for SSA is critical to fulfilling our commitment to complete retirement claims, eliminate the hearings backlog, reduce the number of pending initial disability claims, address other critical workloads, and maintain our aging infrastructure. A reduction in our funding at this time would reverse the progress we have made over the last two years. We know that millions of people are counting on us, and with the President’s proposed level of funding for SSA, we will continue to provide the service the American people need and deserve. As part of the Social Security Independence and Program Improvements Act of 1994, SSA was provided with its own statutory Inspector General. As mandated by the Inspector General Act of 1978, as amended, the Office of the Inspector General’s (OIG) mission is to protect the integrity of SSA’s programs. The OIG is directly responsible for promoting economy, efficiency and effectiveness in SSA programs and detecting and preventing fraud, waste and abuse. This mission is carried out through a nationwide network of audits and investigations. In conducting audits and investigations, the Inspector General works closely with both the Congress and SSA to improve program management. • $13 million for other operating expenses such as rent, travel, service agreements, investigative equipment, and supplies. This request is an increase of $3.44 million (3.35 percent) compared to the FY 2010 enacted level. This increase covers the costs of payroll increases including Federal pay raises, within-grade increases, benefit rate increases for health benefits, and higher costs for newer employees hired under the Federal Employees’ Retirement System (FERS). The budget request is driven primarily by costs (including salaries, benefits, rent and core services) associated with supporting the staffing levels needed to conduct audits and investigations. The FY 2011 request supports a staffing level of 596 workyears. With the resources included in this request, OIG will continue to support ongoing major initiatives that focus on key areas such as the protection of personally identifiable information, including the protection and integrity of the Social Security number. OIG will also continue to aggressively pursue anti-fraud activities on a variety of fronts. The Cooperative Disability Investigation Program will continue to investigate disability program fraud while other personnel will combat improper OASDI and SSI payments. FY 2011 will bring new opportunities for the OIG to fulfill its mission, as well as to confront the continuing challenges of assuring integrity in the nation’s largest benefit-paying programs. This budget request provides funding to enable the OIG to carry out that mission and to support SSA’s efforts to seek efficiencies, avoid erroneous payments, and combat fraud.